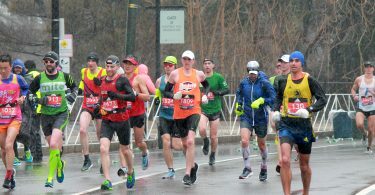 BOSTON — When Andrea Piscopo steps up to the start line on Monday morning, she won’t be thinking about all the nights she was jolted awake to horrific violence by the hands of her ex-boyfriend. She won’t be thinking about how she doesn’t have a 401k at 40 years old because she spent every penny of it to get custody of her two children. And she definitely won’t be thinking about the three-hour deposition where the very core of her motherhood, and personhood, was questioned. 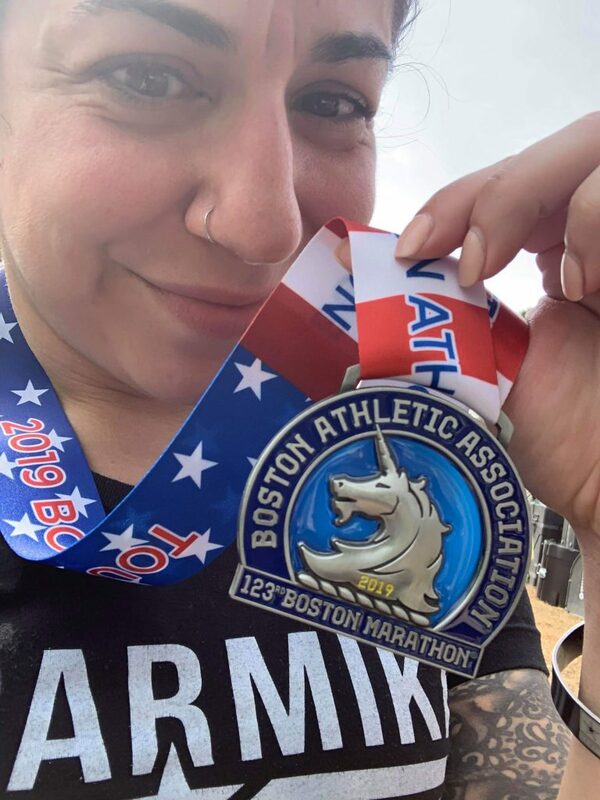 Piscopo, an Attleboro resident by way of Boston, is spending her weekend running three marathons, often called the “Trifecta” — The Tough Ruck, Boston’s Midnight Ride and the Boston Marathon — all in 24 hours. Why? 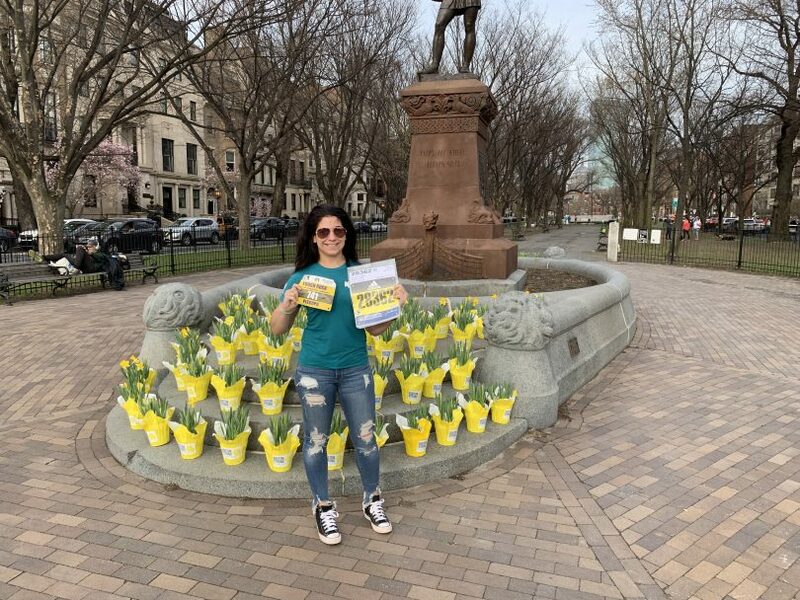 To raise money to end domestic violence with New Hope, the Massachusetts-based charity that helped her leave her abuser in 2013. After the birth of her son in 2010, Piscopo was desperate for a way to cope with her abusive situation. As she was already a weight-lifter, she decided to face one thing she was never good at — running. “What was a way to deal with the emotional stress became very liberating and empowering,” she said. In the past nine years, Piscopo has run about 20 marathons with this Monday’s race being her fourth Boston Marathon. Yet, her abuse still haunts her and her family to this day as her post-traumatic stress has manifested itself in her daily life. She hates crowds and loud noises, looks for at least two exits when she enters a room and moved her court paperwork to a friend’s house because it was causing her so much distress. When Piscopo realized she was in an abusive relationship in 2010, it took her years to leave. After two children –a then-two-year-old girl and a newborn baby boy– and nearly four years with her partner, Piscopo started googling domestic violence hotlines. She stumbled upon New Hope’s phone number: 800-323-HOPE. New Hope, Inc. is a non-profit organization with a simple vision — that “every person has the right to live a life free of violence and exploitation,” their website says. The charity offers a confidential 24-hour hotline, emergency shelter, counseling, community-based advocates who can specifically help with restraining orders, supervised visitation, housing stabilization and a civilian police advocate. “It wasn’t until an older woman looked at me and said: “Embrace your horror for everything that it is,” that it hit me. Nobody ever told me I was in an abusive relationship,” Piscopo said. Now, she shares that saying with other survivors of abuse whenever she can. That, and she tells them to not use drugs or alcohol to numb the pain. To Piscopo, getting through a marathon is a lot like getting through life — the energy and support propel her through the rough times and to the finish line. And when the going gets tough, she recites the tattoo on her left foot — an excerpt from the poem Stopping by Woods on a Snowy Evening by Robert Frost. “I love that poem… “But I have promises to keep, and miles to go before I sleep,”” Piscopo recited and trailed off with a smile on her face. Mostly when she’s running, Piscopo puts on some music and starts counting. 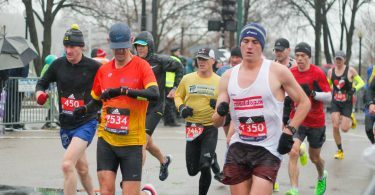 Competing in the three races is not just for personal growth, and certainly not the accompanying aches and pains that come with the trifecta. As of Monday morning, Piscopo raised $4,750 for New Hope as a way to “pay it forward” for their role in her life. Piscopo had a loose goal of finishing the races on foot under 6 hours, but finished the Tough Ruck in seven hours and 14 minutes while carrying 35 pounds. As for the Midnight Ride, Piscopo finished in two hours and 45 minutes.